What is Marichi's Pose C? Marichi's pose C, or marichyasana C in Sanskrit, in a seated twist that's part of Ashtanga yoga's primary series. 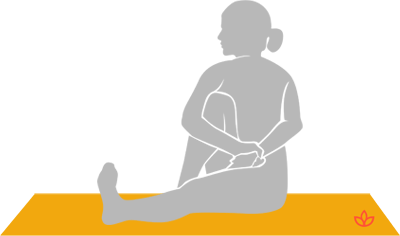 With one leg extended and the other bent, the practitioner twists toward the bent leg. The challening part here is to wrap the arm around the bent leg and bind them behind the back, which gives a deep twist to the thoracic spine. Bend the right leg. Place the foot close to the right buttocks. Reach the left arm around the right leg. Reach the right arm behind, then grab hold of the wrist. Gaze to the left.